The 2017 Development Cup offered Andorra to form a national team for the first time and serve as host of an international ice hockey tournament. Although the host team lost the games against Morocco, Ireland and Portugal, it was a good experience for them. “It’s our first appearance in an international event. It was difficult against the opponents. We thought we could win against Portugal but we were not so good at converting the shots,” said Aleix Manosas, the local club’s President and Vicef President of the Andorran Ice Sports Federation who was in the net for his team. Ice sports in Andorra are centred in the 2,000-soul village of Canillo in the northern part of the country in the Pyrenees. It is one of the major winter sport destinations in the country last but not least thanks to having the principality’s only ice rink, the Palau de Gel (“Ice Palace” in Catalan) that includes a full-size ice rink with 1,500 seats and an indoor swimming pool. The opening of the ice rink in 1987 was the start of ice hockey, ice skating and curling in the country. 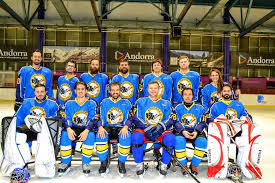 The only hockey club, Andorra Hoquei Gel, was founded in 1990. The Andorran Ice Sports Federation came into existence in 1992 and joined the IIHF in 1995. Since then Andorra hasn’t hit the international spotlight that much. Senior and junior teams sometimes play games in their neighbourhood with cities with hockey clubs such as Puigcerda (48 km) and Barcelona (200 km) in Spain, or Font-Romeu (65 km) or Toulouse (170 km) in France in driving distance. And in 1997 Spain hosted the 1997 IIHF Ice Hockey World Championship D-Pool in Canillo. “I remember Korea was here and now they earned promotion to the top division. I know we cannot play against Finland or Sweden like them but why not play in the lower divisions? We’ll fight for that. We are sure that the event is a sign that more people can try to play hockey like us and that more children will play the sport. Like that we can have a better team in the future,” said Manosas. According to him there are 90 ice hockey players in the country, about half are senior players and half are children including 12 girls. “Hockey in Andorra is played by only few people. Football and basketball are the sport played most often here. But in Canillo it’s a bit colder than in the rest in the country and we have an ice rink. We’ve been developing hockey since the early ‘90s and have been progressing step by step culminating with hosting the Development Cup,” he said. 2017 was a milestone with having the first official national team. It was mostly composed of players from the local club but also included former players of the club who moved to France including defenceman Louison Courcol (Poitiers), forward Alex Palmitjavilla (Montpellier) and captain Ludovic Blasi (Font-Romeu), who all play in the French fourth-tier competition. “Most players are from Canillo, about 70 per cent, or from other towns in Andorra. We just had three players who played in France because they are students. In Andorra we don’t have a lot of universities so they have to go abroad. It’s good for us because they can see another style of hockey and coaching,” Manosas said about the situation in the high-altitude country of around 80,000 inhabitants. For captain Blasi the event has been a great experience despite the losses. “We are a small country with a few hockey players in Andorra and those who went to play abroad play at amateur level. We try to play against better teams like at the Development Cup, which is a good way to progress and grow hockey in Andorra,” the captain said. “10 to 12 players from the team have never played according to IIHF rules and with body-checking before. They were adapting the game with more intensity and more shots. Andorra has a senior and now a youth team to make progress with the youngest players. “We formed the under-10 team last year. They competed in two tournaments here and in Barcelona so they had 12 games. In the new season we want to take part in four tournaments so in the future we will hopefully have future champs,” Manosas said. The three highest save percentages of Dominik Hasek’s international career were .961, .924 and .923. Those numbers came in international tournaments like the Winter Olympics or World Championships when “The Dominator” played in at least four games of each tournament. In the process, Hasek won an Olympic gold and bronze, and a World Championship silver with three bronze. The Hockey Hall of Famer’s Olympic career save percentage is a staggering .946. As every hockey fan knows, very little ever got by Hasek. The three highest save percentages (thus far) for fellow Czech goaltender Klára Peslarová in which she has played at least four tournament games have been .975, .954, and .951. Yeah, not much gets by her either. And she is only a 20-year-old. “My brother Jakub always said, ‘You are like “You are like Dominik Hasek in a skirt’,” Peslarová shared. Like most elite hockey players, Peslarová began playing hockey at a very young age. Born November 23, 1996 in the Czech city of Ostrava she ended up finding inspiration as a goaltender from two remarkable Swedes instead of her fellow countryman, Hasek. Around the world, numerous hockey leagues are beginning their 2017-18 seasons. Peslarová is now returning to play in the Czech Republic with a men’s team, HC RT TORAX Poruba after playing two seasons for SDE HF of the Svenska damhockeyligan (SDHL); the top women’s league in Sweden. The SDE HF hockey club is located in Stockholm. While she may be returning to her homeland, it would seem that Peslarová had developed a kinship toward the Scandinavian country long ago. “Henrik Lundqvist was always my hero,” she explained. Martin Hasson is a silver and bronze Olympic medalist for Sweden, and an NCAA champion from her time with the University of Minnesota Duluth. She is also the Athlete Ambassador to the Czech Republic, and worked with Peslarová at one of the IIHF’s high performance camps when the Czech was a youngster. Peslarová first got into international play for the Czech Republic during the 2013 IIHF Women’s U18 tournament held in Finland. She appeared in five of the Czech Republic’s six tournament games and posted an important win over Russia. Peslarová’s statistics from that showcase are a bit tough to swallow from sight alone, as her .880 save percentage is rather average while her 5.18 goals against average is cringe-worthy to look at. However, those numbers do not tell the entire story though. Keep in mind that Peslarová was only 16 at the time of this tournament. In a 10-0 drubbing by the United States in the semifinals she took on 42 shots of a total 76 that the U.S. peppered onto the Czech net that game, and still stopped 37 of them. Her other save totals in the tournament games were 11, 28, 26 and 30 respectively. Certainly a solid performance by a first year player on the national team. The numbers that Peslarová was about to produce from here on out would seem otherworldly. The 2014 IIHF Women’s U18 tournament was held in Budapest, Hungary and would be the final U18 of Peslarová’s career. Seemingly, this tournament belonged to her. Through Peslarová’s remarkable play in net, the Czech Republic would win only their second medal in the tournament’s history, and their first since 2008 when the Women’s U18 was first brought about by the IIHF. Peslarová was brilliant in net. She posted four wins to go with two losses, with one of the wins coming in a shootout over Finland in the Czech Republic’s first game of the tournament. She shut out Sweden in the quarterfinals of the tournament 3-0, and then did the same to Russia in the bronze medal game by a score of 1-0. In total, she played 345:00 of ice time, allowed a mere nine goals in six games, had a 1.57 goals against and a whopping .951 save percentage. Peslarová’s greatest heroics came in the 3-1 semifinal loss to the United States. In the 2013 tournament, the Czech Republic had twice allowed 10 goals to the U.S. the two times the teams squared off. This time Peslarová was a wall that could also move and stand on its head. The U.S. put 61 shots on Peslarová and she steered aside 58 of them. In a most deserving performance, Peslarová would be named the Best Goaltender award recipient for the entire tournament. The IIHF decided to host a Women’s World Championships during an Olympic year for the first time in 2014. In order to continue the development of teams not participating in the Sochi Games, the IIHF continued to fund participation in the women’s tournament. The Czech Republic simply ran the table over the likes of Norway, France, Denmark, Austria and Slovakia at that year’s Division I Women’s Worlds. Peslarová had now graduated to the Czech women’s national team and once again shined brighter than the sun as their star goaltender. Peslarová went a perfect 4-0 throughout the tournament as she helped vault the Czech Republic into the top division for women’s international play. The Czech Republic won all five of their games, and Peslarová was once again named the tournament’s Best Goaltender. In her four games she allowed only two goals and posted an almost unfathomable 0.50 goals against and a .975 save percentage. There would be a near exact repeat performance by Peslarová in 2015 in France. The Czech Republic went a perfect 5-0 once more throughout the Division I tournament to again be promoted back into the top division. Peslarová allowed just two goals — one each to Latvia and Austria — and posted shutouts over France and Denmark. Once again she finished with a 0.50 for goals against as well as a .954 save percentage. For the third time in international play, Peslarová would be named Best Goaltender. Dominik Hasek played professional hockey until he was 46 years old. Klára Peslarová will turn 21 at the end of next month. Hasek didn’t play his best hockey until after he turned 30 and won Stanley Cups at the ages of 37 and 43. That being said, Peslarová has many, many more years of elite level hockey left to play. The Czech Republic are not one of the eight teams participating at the upcoming 2018 PyeonChang Games in South Korea. Make no mistake, Peslarová will do everything in her power to get her country there in 2022. She possesses numerous intangibles that will help ensure that it happens. At the very least, we know that there will be a solid number of more years to enjoy the play of Peslarová. When all is said and done, she may very well be forever known as “the female Hasek”. Perhaps someday there may even be a goaltender known as “the male Peslarová”.